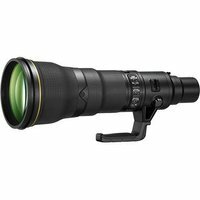 The Nikon 800mm f/5.6E FL ED VR Lens is an FX-format compatible, super-telephoto lens ideal for shooting distant subjects with a maximum aperture of f/5.6. Lightweight and rugged, this 800mm lens is features a magnesium alloy body to ensure a well-balanced and comfortable grip when handling it in the field. The two fluorite elements achieve higher transmission rates and lower dispersion than regular ED glass elements. Built-in VR (Vibration Reduction) minimises the effect of camera shake, letting you use shutter speeds that are up to four stops slower. This professional lens includes a dedicated, custom-tuned 1.25x teleconverter that extends the focal reach to 1000mm with effective maximum aperture of f/7, while maintaining exceptional optical performance.